Supports up to 100 lbs. Allowing you to stack multiple A/V components. The double-stud installation lets you center your A/V equipment directly beneath a flat-panel TV or other display. 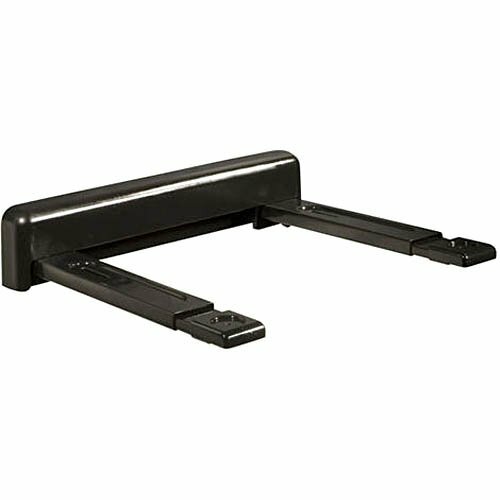 Adjustable width up to 18" As well as an adjustable depth range from 15" to 23" accommodates large components, such as receivers and multidisc DVD players. The adjustment knobs allow easy leveling. Scratch-resistant, fused-epoxy plastic construction With a powdercoat finish provides a durable design. Embossed arms with screw holes Enable you to secure your components to the shelf. Decorative snap-on covers Conceal the mounting hardware to create a seamless look. A versatile solution that not only looks great, but let's you easily incorporate A/V components into virtually any environment. This flexible and space-saving shelf gets A/V components organized and out of the way. It offers a low-profile solution that mounts to two studs allowing you to center components under the screen, completing the picture-perfect installation. Most A/V components up to 100 lbs.